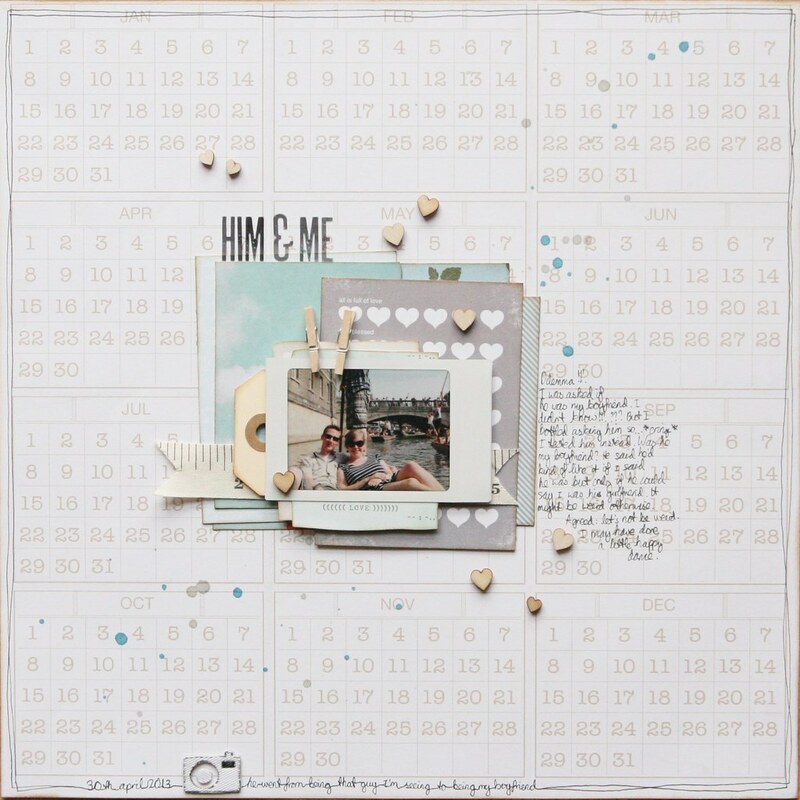 I am currently taking part in Shimelle's new class The Scrapbook Process which has an emphasis on considering scrapbook albums as a whole. I am really enjoying going back through my albums, thinking about putting them together more cohesively, and getting more of my memories down on paper. As part of this process, it's lovely to pull out older pages that you love and breathe new life into them by recreating the design for a new layout. Today I want to share how I recycled a page design that I used back in 2013, to make a new page for my album. I made this page in Autumn almost three years ago. You can read my original blog post here where I shared more details of the process of creating the layout, as well as the story behind the page. I have always loved this page, which is due in no small part to the meaning it holds for me. But I love the design too: I like that it's uncluttered but detailed, that there is colour but it all blends and there's plenty of white space. 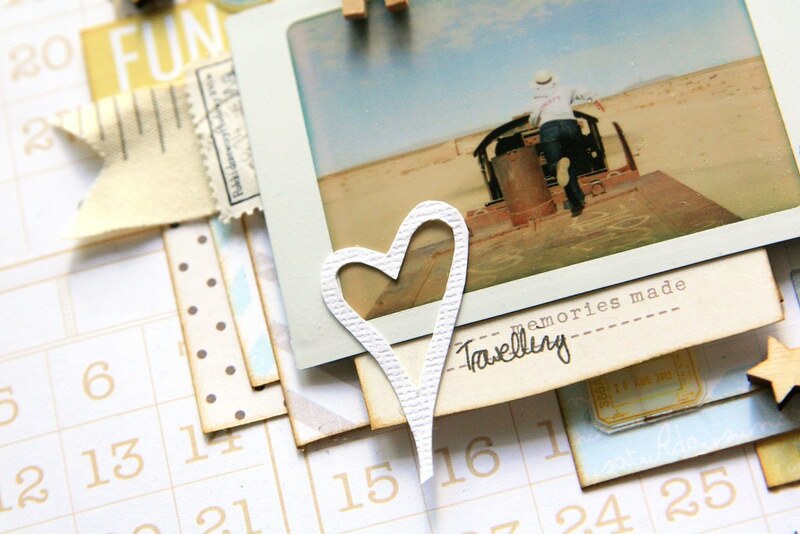 I love little details like the wooden hearts and pegs, and my tape-measure ribbon, and I like that it embodies my usual style with layers, handwriting and a little camera. So this was the ideal page to scraplift. When it comes to scraplifting, you can be as literal or as figurative as you like. In this instance, I have kept a lot of the features of the original: the instant photo, the two little pegs, the tape-measure ribbon and even the same background paper. In fact I have several sheets of that background paper still in my stash as its such a brilliant neutral, but is useful when I want something a bit more than plain white. I bought a whole bunch of sheets when it was available and I am carefully rationing them out! The nice thing about scraplifting is that it removes some of the decision-making process, meaning I can just get on with cutting and sticking in my own happy little way. So I kept the same page structure: layers of journaling cards and patterned paper in the middle of the page, anchored with a ribbon and topped with a little instax print. But I matched the colours to the photo where possible, using sky blues, sandy brown and muted grey. For the embellishment, I then departed from the original and just added whatever I fancied. 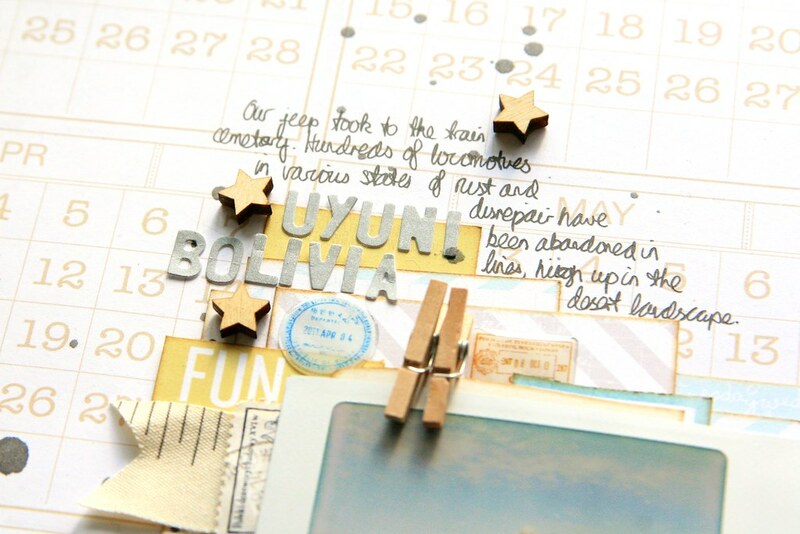 I found the puffy travel-stamp-style stickers in Paperchase the other week, and they're lovely for travel pages. Rather than imitating the original page precisely, I split the title and journaling between two locations. This page tells the story of my visit to the Uyuni Train Cemetary; you can read about that particular adventure here. The title split quite naturally: the top reads 'Uyuni, Bolivia' so that the location is clear, and then the lower half more descriptive. As these letter stickers are quite tiny, it's possible to get plenty of title on the page without overwhelming everything else. 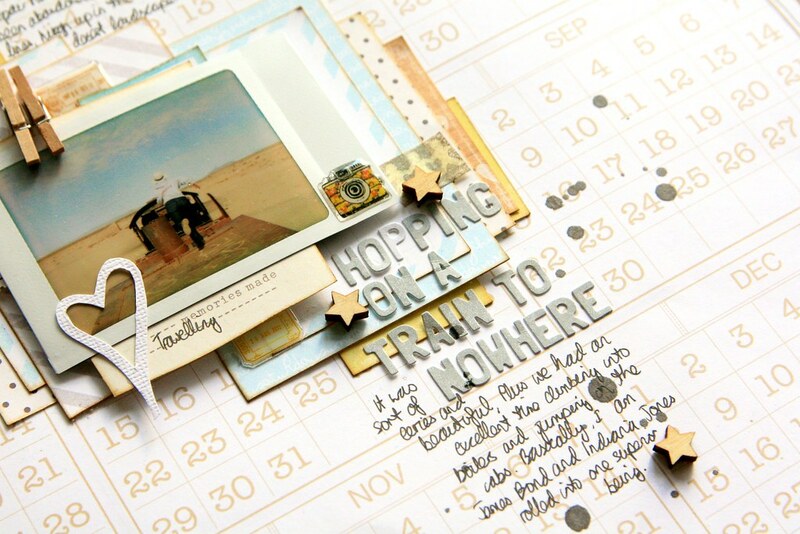 I then used the journaling to balance out the design, adding some above, and some below. There wasn't a huge amount to say as this is the kind of story that basically says I was there, and it was amazing. I have lots of other pictures which I will put in a divided page protector to go with this page, and they will tell more story that I'd be able to in words. All that remained was to finish off the embellishment: a hand-cut heart, a few wooden stars scattered hither and yon, and a splatter of ink droplets. Because you have to have ink. While there are clearly strong similarities between these two pages, I am also aware of their differences. While these two pages won't be together in the same album, I wouldn't actually mind if they ended up next to each other, as I think they complement each other well. It's all going to depend on your personal taste, but to me these pages don't look too similar at all, despite the fact that one is a scraplift of the other. 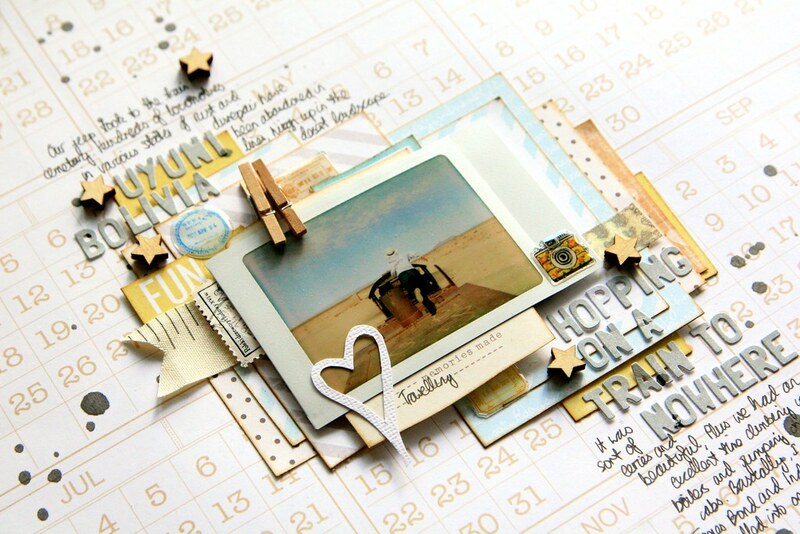 Instead what jumps out at me is the consistency in the way I liked to scrapbook then, and still like to scrapbook now. P.S. 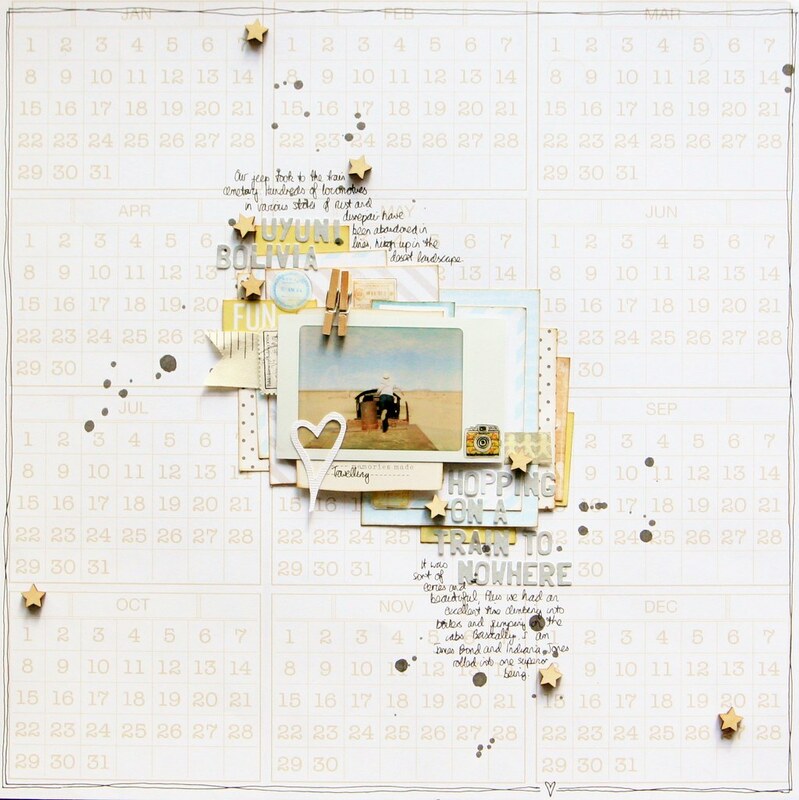 You can find more information about Shimelle's class 'The Scrapbook Process' here. This is one of the best classes I have ever taken, so it certainly comes highly recommended from me! 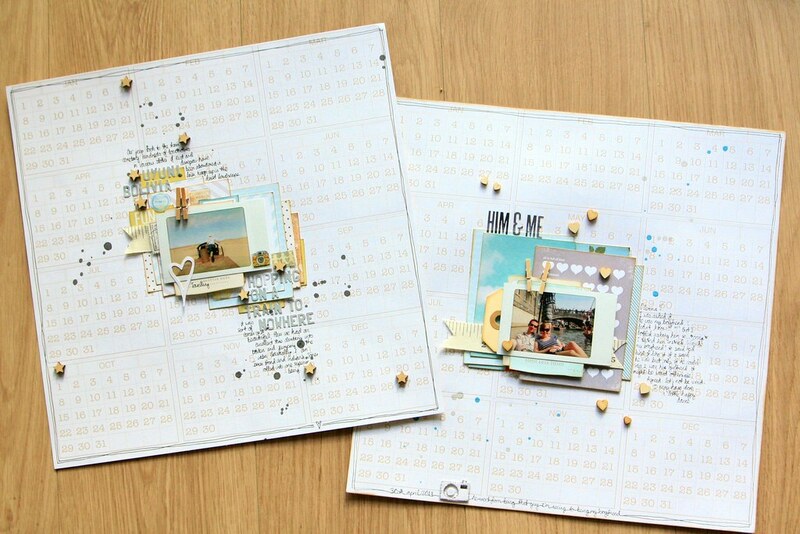 Both your layouts are lovely - I might have to have a go at scraplifting myself as well. Both beautiful pages but I love how they look so similar and yet different. I loved your Blog for Earth Day Activities, I'm going to Follow Your Post for my Gardening and planting trees on Earth day. You are an amazing nature loving Person.